Commercial, small farm or wool production, the versatile Finnsheep excels in a variety of markets. 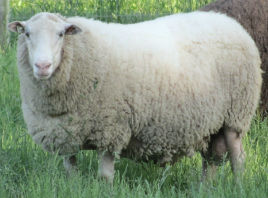 Purebred Finnsheep are capable of producing a 300% lamb crop with average crossbred lamb crops ranging from 180% to 230% depending on percentage of Finnsheep genetics. With proper nutrition, Finnsheep ewes are excellent milk producers and they can raise triplets on their own. Finn ewes cycle out of season allowing for spring and fall lamb crops and three crops in two years if this production method is selected. In addition to their outstanding production abilities, Finnsheep can improve the quality of the wool clip by increasing the fineness and uniformity. Finnsheep allow the addition of colored wools as well (if selected) allowing commercial producers to penetrate an exclusive niche market. Long known for their outstanding mothering abilities, Finnsheep ewes get their lambs cleaned, up and nursing shortly after birth giving them the best chance for survival. The nutrient-rich milk of a well-nourished Finn ewe provides lambs with an outstanding rate of gain, well within parameters for profitable lamb production. Wool production and markets should always be considered when producing lamb for the market. Finn wool characteristics from quality representatives of the breed can dramatically enhance and improve the fineness, quality and marketability of the crossbred production flock. Quality wool sells and this provides an alternative income stream for the producer. Finnsheep genetics fit very well in large scale operations as well as small, local and grass-fed production programs. The Finnsheep, due to its unique ability to produce a wide variety of products is also more environmentally friendly! The breed is a natural fit for smaller, community supported farms, requiring less resources to get products to market and into the hands of the customer. The calm, quiet temperament of the Finnsheep breed makes it well-suited for smaller family farms and children.